Reciting any line from the episode which celebrates its 25th anniversary this week will give it away in an instant. While June 18th was the first time it was seen, the finale of The Next Generation's third season was aired in syndication which means it was shown across the US on different days and times. In the UK we would have to wait a further 12 months to see the episode (and it's conclusion) at 6pm, Wednesday night on BBC2. Big UK Star Trek fact - the week after the second part aired, the BBC went on to show The Original Series starting with the first UK showing of The Cage. The Best of Both Worlds is arguably one episode which appears in every fan's top ten. It's definitely in mine but after 25 years is it still worthy of its near-legendary status? Q Who was responsible for introducing the Borg but, like the Conspiracy aliens or the original conception of the Ferengi, maybe even the Swarm from Voyager, it could well have been a one off. 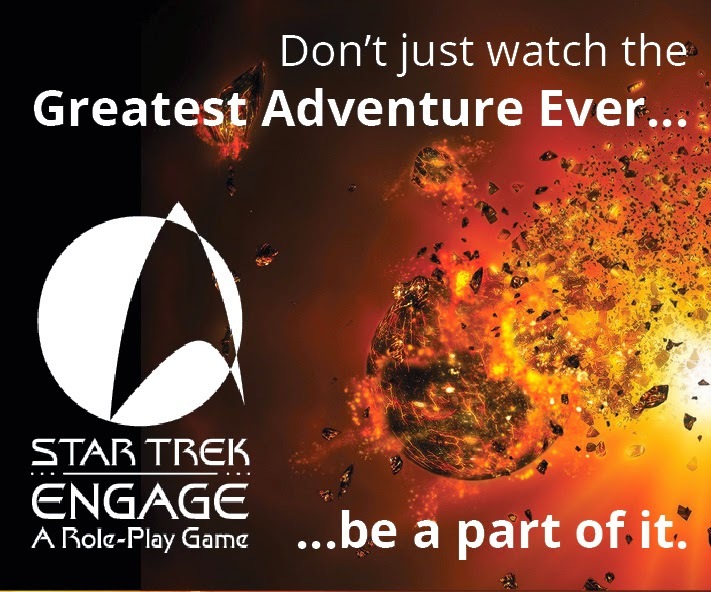 Michael Piller created a landmark story character driven, heart-rending and action-packed that epitomised the very best of not just The Next Generation but Star Trek as a whole. Filled with some of the best and most insightful dialogue ever written, a stirring, unique choral soundtrack and genuine edge-of-the-seat sequences for The Next Generation it was the show's big coming of age moment at the same point that it's illustrious predecessor had been saying goodbye. Time and time again Star Trek has returned to this point, these events which alone speaks volumes of its importance. Maybe no other episode will ever live up to the hype but The Best of Both Worlds gave the whole crew an opportunity to shine and brought in the character of Shelby to boot and the (for once not a madman) Admiral Hansen. These are two of The Next Generation's best supporting characters and the tragedy is that neither came back following this story. 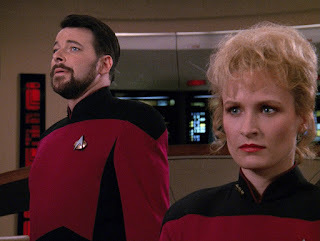 Elizabeth Dennehy could easily have stepped into the first officer role in season four proving to be a sharp foil for Riker even in just the two episodes featuring her character but it wasn't to be since Patrick Stewart did return and remain on the Enterprise. 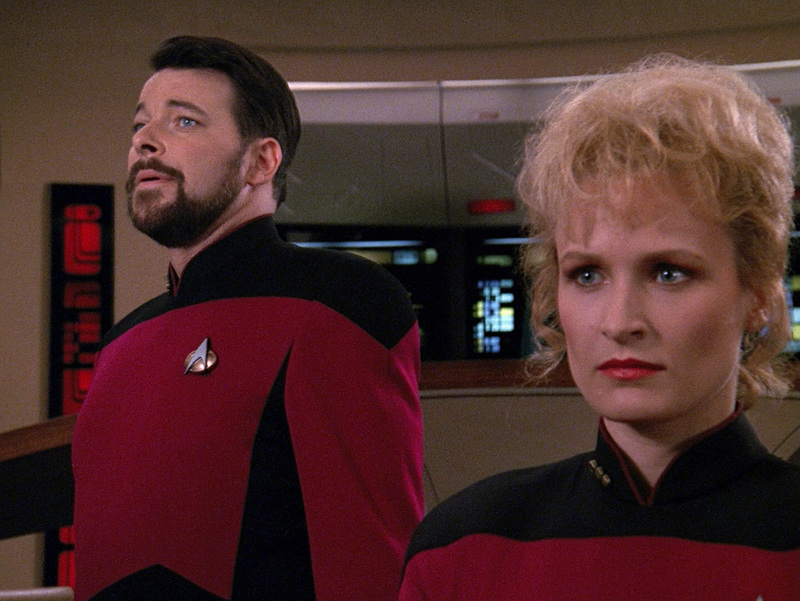 However, while she's the ambitious upstart that Riker once was, it offers a better chance to understand Number One and his comfort zone as Picard's right-hand man. Shelby disobeys her senior officer, works like a trojan and is out to impress at every step, going behind Riker's back, convinced that she'll be the next first officer of the USS Enterprise. 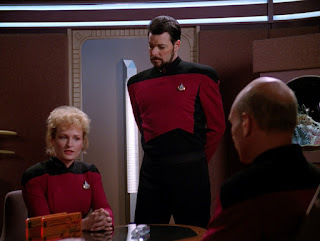 The poker game is edged with tension between the two clashing officers with Shelby's win unsettling Riker even more. While you do start to hate her, your opinion swiftly changes by the end of the story. For me, the self-analysis that Riker undergoes during the first part is some of The Next Generation's best character development and is a stark contrast to the nightmare which is about to explode. I also think it's a massive piece of the overall story and notably the final time until Nemesis that Riker has the chance to command his own ship. 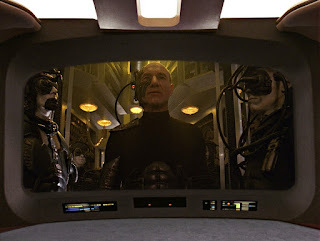 Picard's capture and subsequent semi-assimilation into the Collective as mouthpiece Locutus resonates both through the franchise and for fans right to this day. First Contact in 1996 took us right back to that event, Deep Space Nine's pilot (and only the pilot) used Wolf 359 as a jump-off point for Commander Sisko and Voyager ran with the Borg more than any other show. The collective even managed to get themselves an episode of Enterprise in a rather bold and unexpected move which linked both to their single movie appearance and their first appearance in Q Who. While my thoughts on Voyager's take on the Borg are in flux at the moment, if it wasn't for The Best of Both Worlds and it's success then Voyager may have turned out very differently. Sisko's torment at the loss of his wife and confrontation with Picard in Emissary might not have carries so much resonance. 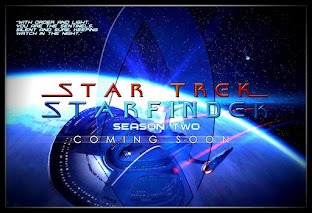 Indeed, the third season finale introduces us to the concept of assimilation. 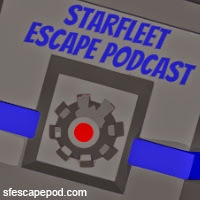 As Shelby notes, the previous encounter at J-25 had shown that the Borg were only interested in technology but here the agenda changes and with it the future of the show. Already they were formidable, seemingly unstoppable but the brilliance of The Best of Both Worlds lies in the fact that the threat became personal and much more deadly. 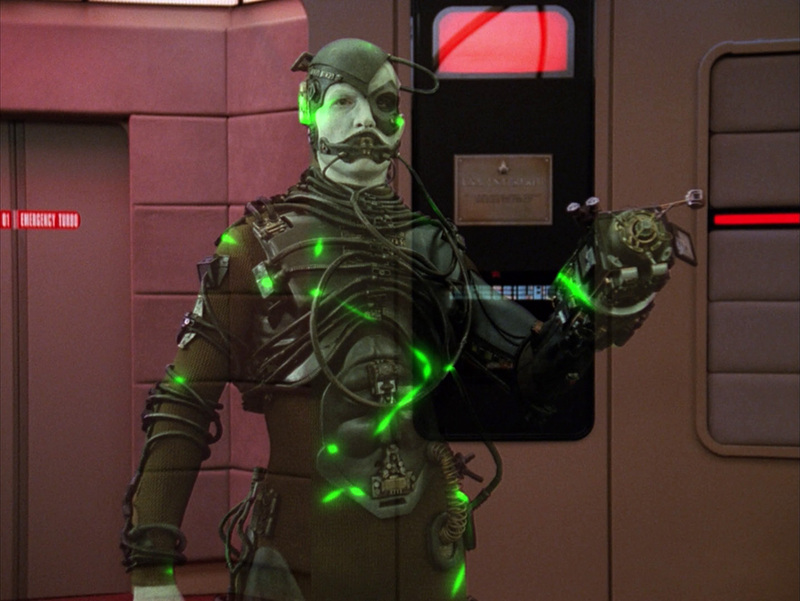 Picard's capture is certainly as horrific if not more so than Chain of Command because something like this had never been attempted before in Star Trek history. Imagine - if there had been no assimilation then there would have been no Seven of Nine. This potential threat that was a long way away was now on the doorstep, had kidnapped the one person who may well have been key to their defeat and every opportunity seemed to have been shut down. 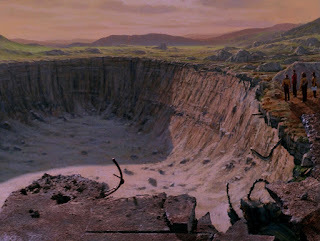 For once it appeared that this could well be game over and that sense of foreboding lies across the whole duration of the episode from the discovery of the crater at Jouret IV (they never do this ever again....) through to the revealing, muted conversation that Picard has with Guinan as he tours the ship shortly before his capture. As with the Riker/Troi conversation, this section of the episode alone propels The Best of Both Worlds to stellar levels. 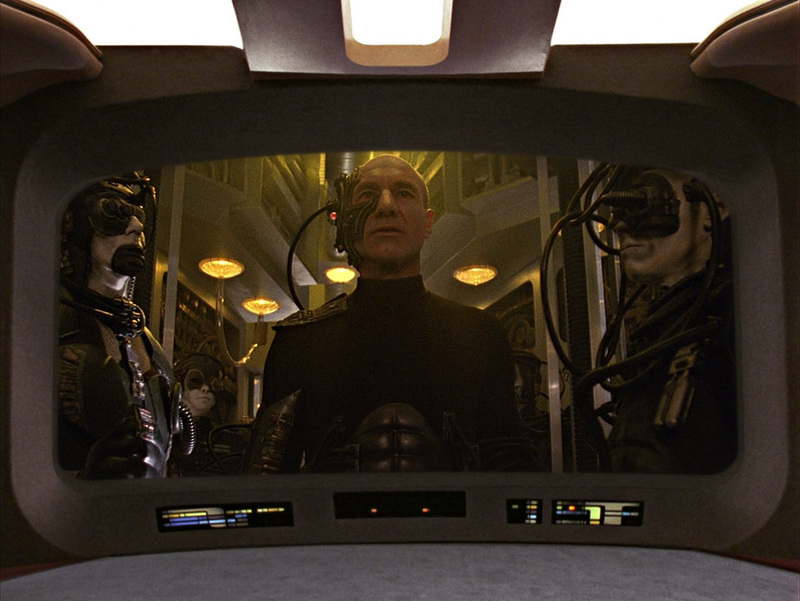 It is a real insightful discussion that lays Picard's fears open in the only setting he is able to voice them. 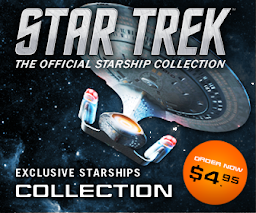 There are so many great one on one pieces here and I'd be wrong not to even mention Picard/Riker or Riker/Shelby both dealing with the first officer's reluctance to move into the centre seat. 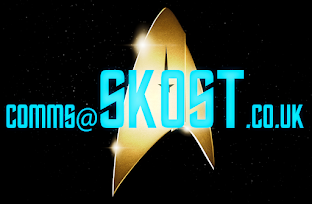 The Best of Both Worlds may be a quarter of a century old but it hits every mark a Star Trek episode needs to. There is literally something for every fan in every scene and I don't tire of watching it; a moral dilemma, action, adventure, an eerie, deadly enemy. 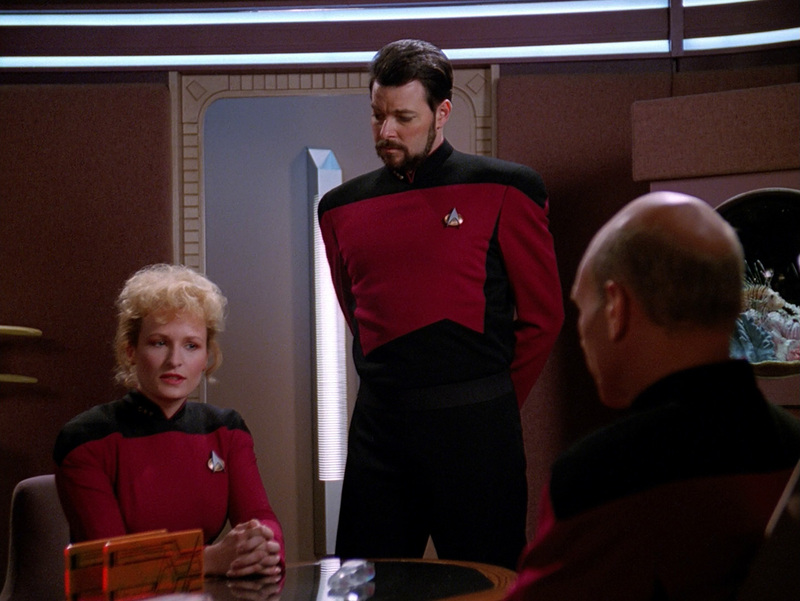 Oddly I can even just watch the first half without the conclusion because that initial hour is so perfect, even to the final face-punching dawning that Picard is lost and the biggest decision of Riker's short command career. So is it worth it's status as one of the best of the best? The best of all episodes? Perhaps it's not the one everyone would pick as number one; The Inner Light is much more emotional; In the Pale Moonlight is potentially Star Trek's darkest hour but if it wasn't for the success of The Best of Both Worlds none of these might have ever seen the light. Michael Piller made some significant changes to The Next Generation with the stories character rather than situation-focused from season three onwards and here he gave something that will at least be high on 99% of fans' favourite installments. My thoughts? Absolutely top three of all time and my favourite The Next Generation episode with Relics in second place. The follow-up with Hugh in I, Borg was OK but once they stepped into Descent and individuality the arch-nemesis of the Federation began to lose it's teeth somewhat. First Contact returned them to the chill-inducing automatons of the first years of The Next Generation if with a significant facelift. 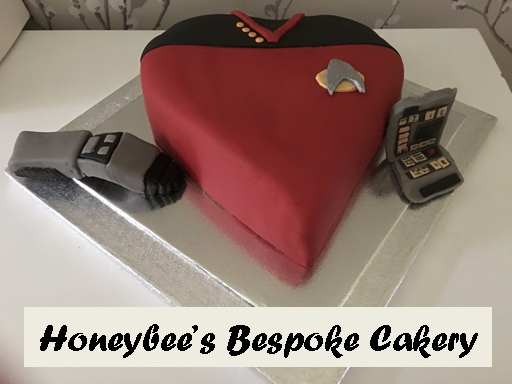 Twenty-five years on since we first discovered that resistance was futile and that the Borg were heading for sector 001, it has to easily be regarded as a classic; ultimate Star Trek to the core. What are your memories of The Best of Both Worlds? Do you think it's still worth the hype? Want to continue the conversation on another platform?